Ah, Christmas day. What did Santa bring?. Frankly, we've outgrown the gift giving stage. But this morning, we surprised each other. 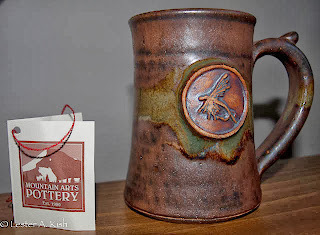 Mountain Arts Pottery I'd been in the market for a new coffee mug for quite a while. Something that held a goodly amount of coffee. It had to have a wide flat bottom so it wouldn't get knocked over easily. It helped if it looked good too. This is what I got. I'm happy with it. Alpacas of Montana Cold feet? I get out an fish in the winter fairly often. It doesn't matter what the air temperature, the water is still cold. Walking on snow conducts the cold through the boots to the old bones pretty quick too. Jo got me a couple of pairs of Alpaca socks. They're nice and cushy. They don't have that "itchy" wool feet either. 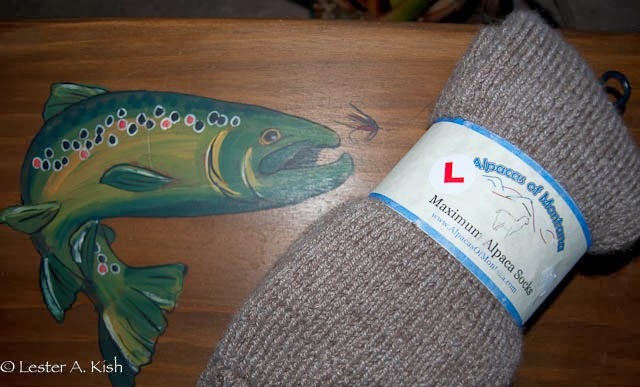 Their website reports that alpaca fleece is warmer than wool and softer than cashmere. It's definitely soft. As for warmth, I'll have to report back after I've worn a pair fishing all day. There's a lot of stuff on the market. It's good to buy local. Both of the above are made in Bozeman, Montana. And, what did Santa bring my lovely wife? Well, we spent a night at the Konkolville Motel in Orofino, Idaho last fall. You could make your own breakfast. They had one of those flip waffle makers. Santa likes waffles. Need I say more?